Black and gold combination is a spectacular one which enhances your appearance. 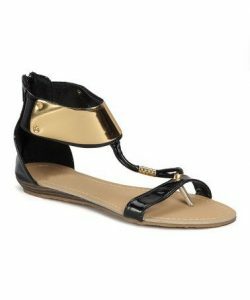 It could be with a classy dress or a casual outfit, but when teamed up with such sandals, you are sure to look glamorous. The following list contains two sections, depending on their heels, as some have them and some don’t. 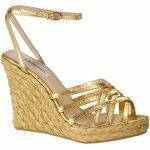 A pair of flats, with chunky straps in metallic gold and leather materials, complement your boho look. Since they have no heels, wearing them to anywhere is possible. This design is followed keeping in mind the minimalistic choice of women. Simply styled with gold straps while the black base offers an innovative look. Black stilettos with a dash of golden shade have a dressy look. 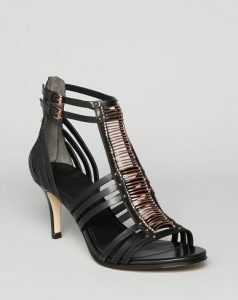 The straps are modish and give the pair an edgy vibe. For a cocktail party, slip into a champagne maxi dress and a pair of heels like the following one. The heels are golden while the shoes are mostly black. To pull off a goth look like a fashionista, you may need such shoes, having its own attitude. The strappy style is a big hit amidst ladies.